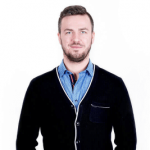 Is CRM product management the new kid on the sales block? Do you know your best selling products? Or how about products that should be moving, but just don’t seem to have the momentum? Which salespeople are selling which products? And, which products are showing the most profitability? Teamgate sales CRM product management features can deliver those answers, and quickly – keeping you ahead of the posse. Not every business model needs a product management solution, but for those that do CRM product management is fast becoming a game-changer for sales professionals with an eye on the ball. 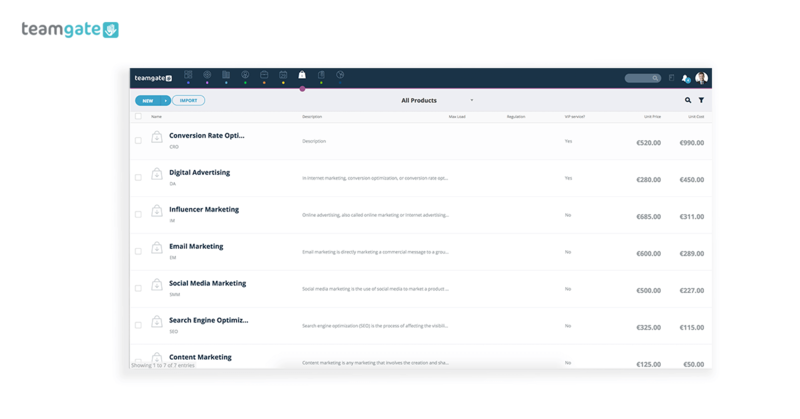 Along with actively combining to manage your sales pipeline, Teamgate gives you the advantage of a CRM product catalogue directly within your CRM software. The product catalogue gives your sales team access to every single product on your inventory – it doesn’t matter how many products you have – and all directly from within your Teamgate CRM software Having direct access to your product catalogue, along with knowledge of the products preferred by your customers – directly in your CRM deals card – gives you a distinct advantage when attempting to maximise your sales volume. Plus, sales managers need to be able to understand in an instant, who’s selling what product to whom, and for how much. Teamgate analytics and smart reports give you the power to produce detailed information on all the sales statistics you need when you need them. Does keeping track of your products slow you down? Products and services come in many shapes and sizes. In the past keeping track of a large inventory of company products was both confusing and time-consuming. Not knowing which customers bought what, when, and for how much often meant redoubling of sales efforts in the wrong areas; wasting time, effort, and money. If your sales business is product heavy – offering many similar lines, with a multitude of variations, e.g. small engineering or electrical components – not knowing your customers’ buying history can be fraught with time-wasting communications as you attempt to clarify matters. Sales managers need answers, and they usually need them fast. In the past, manually compiling product management reports was a slow and laborious task – and the results weren’t always accurate. Going through reams of sales invoices and contracts, physically counting quantities of items sold, calculating their sales value, and the margin of profitability – it all took time. Eliminating these time-consuming tasks aids your success and the profitability of your business. But how can CRM product management help you regain that time, and help drive your business towards greater profitability? Time-saving – It lets your sales teams use their time more creatively by intuitively tracking products and deals in one easily manageable location. Know your products – See your full range of products instantly, including unit prices and profitability. Clever analysis – Products can feature additional information – unit cost and unit price – making further analysis and forecasting smarter and easier. Smart reporting – Create all the detailed reports and analysis necessary for quick and concise product management and sales forecasting. Collaboration and ownership – By showing ownership and responsibility for products, sales managers can easily check which products are more successful for each of their sales team. Plus allowing collaboration on products – and deals – can allow reps to seamlessly coordinate their efforts. Neglected products – Analyse which products are being neglected and need to be retargeted. 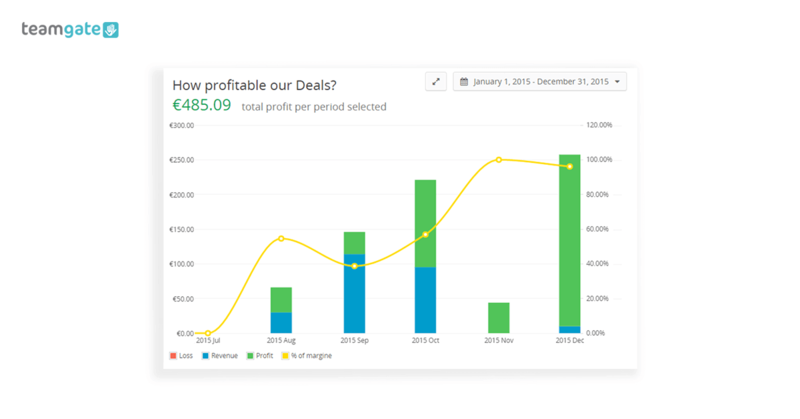 Know your profit margins – Calculate sales revenue and profit margins on products at a glance. Product groups – Create ‘product groups’ in order to organise and manage your products better. In-stock products – Set ‘In-Stock’ notifications to monitor the availability of products. Filter your products – Filter large amounts of bulky products into sub-sections using custom fields. Avoid manual input – Import products or services directly from your e-store, eliminating tedious, and time-stealing manual data entry. Products and people – See which products are linked with which sales personnel. Goal setting – Create and set weekly, monthly, or yearly goals for individual products. Just like all of Teamgate’s integral features, getting up and running with your Teamgate product catalogue is a straightforward process. Don’t forget, we’re Number 1 CRM for ease-of-use on the market. Simply open the products section of your CRM and you’re ready to start. You can begin by creating a new product in the product catalogue, this can be done manually or by importing existing products from your e-shop (This can be done from CSV or XSLX format documents). If you want to create a new product, simply enter its name, its SKU (if relevant), the category of product (if applicable), product description, unit cost and unit price. You may then assign an owner/s to this product. Next, you can start assigning the relevant products to the relevant opportunities in your sales pipeline. Once that’s been done, and your sales team gets to work, you can start tracking the product via the CRM product catalogue analysis tools. Congratulations. Now, sit back and see how much time you’ve saved. Every single tool or feature which helps you to get to know your customer better, and what they want, is an integral part of your sales process. Teamgate product management features are an integral part of this process. Freeing your sales team’s time is only one step of the process, but it’s a valuable step. Knowing what your past customers want, and what they don’t want will help you target your leads with more accuracy, focus your attention on products that sell rather than products that don’t sell, and helps you understand sales team performance and profitability in a more detailed manner. Assigning certain products to certain sales team members further helps with analysis of performance and allows alterations to be made quickly. Product management is fast becoming an integral part of your whole customer relationship management strategy. Isn’t it time you realised the potential of the Teamgate CRM product catalogue? Take a test drive today. 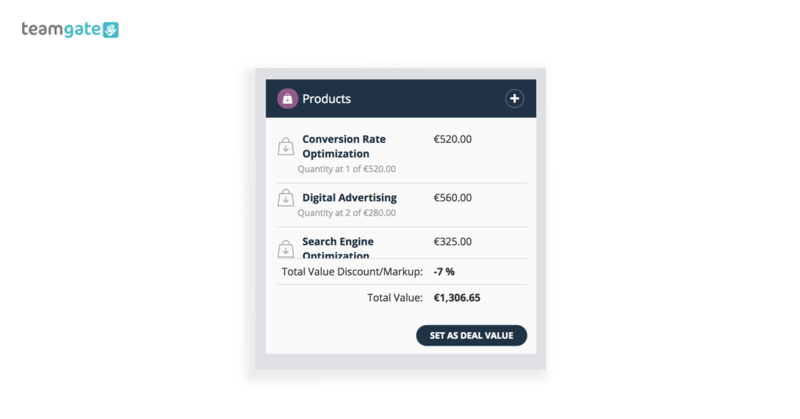 Define and display the goods or services you offer, directly in your deals cards. Find your best products and hit those deals to maximise your sales volume.